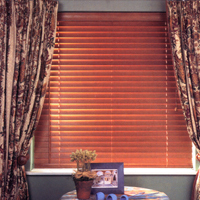 Three new wood effect finishes have been added to the aluminium venetian blind range to complement the existing ranges. Traditional Oak, warm Cherry and cool Sandalwood bring a new dimension to the 'look' of natural timbre. The slim line design and tight stack of the super light slats make this a must for conservatory applications.